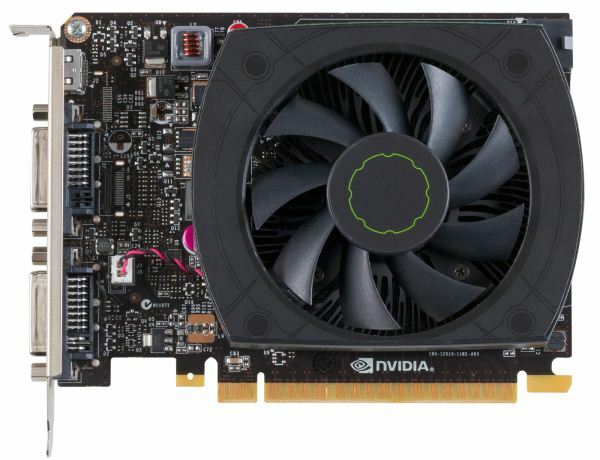 Although none of NVIDIA’s partners will be selling direct copies of the NVIDIA reference design, NVIDIA did send over one of reference cards to serve as a baseline comparison (as it turns out, due to a bug you can’t underclock a GTX 650 Ti right now). Since most partner designs will closely follow NVIDIA’s reference design this actually works out for the best anyhow, as it offers a good insight into the kind of performance and design baseline we should see. For the GeForce 600 series NVIDIA’s reference designs have been extremely solid (overclocking withstanding) and the reference GTX 650 Ti continues that tradition. The PCB itself is actually lifted from the GTX 650, which despite the difference in GPUs is pin-compatible with the GTX 650 Ti and its 128bit memory bus. This puts the length of the card at 5.75” – about as short as a PCIe x16 card can be – in a full-profile form factor. Meanwhile though taking inventory of every last electrical component isn’t practical, as near as we can tell the PCB and its components are completely identical to the reference GTX 650, which means partners are going to be able to easily drop the GTX 650 Ti into their existing GTX 650 designs so long as their cooling is adequate. Speaking of cooling, the cooler on the reference GTX 650 Ti is a small but effective open air double-wide cooler. NVIDIA’s using a low-profile aluminum heatsink that covers roughly half the card, topped with an 80mm fan. This is the cooler style that most partners will mimic, as the 110W TDP of the GTX 650 Ti does not require a particularly large cooler; though on that note at 110W passive cooling is unlikely. As is common with open air coolers, the heatsink itself doesn’t make contact with the on-board RAM, so RAM cooling is left to airflow coming off of the fan. NVIDIA’s RAM of choice for the GTX 650 Ti is their traditional favorite, Hynix 2Gb 6GHz GDDR5. The use of 6GHz RAM, which will be common across this family, means that the GTX 650 Ti will have some memory overclocking headroom right out of the box, memory bus willing. NVIDIA uses 4 pieces of it in a 4x32bit configuration, with 4 more pads on the back of the card for another 4 pieces for 2GB cards. Moving on, along with losing GPU boost capabilities the GTX 650 family also gives up SLI capabilities, so unlike the GTX 550 Ti you won’t find a SLI bridge connector here. What you will find is 1 6pin PCIe power socket on the rear of the card for providing the extra power the GTX 650 needs. Meanwhile display connectivity is provided by 1 DL-DVI-I port, 1 DL-DVI-D port, and a mini-HDMI port. Since all of the Kepler GPUs support 4 displays the GTX 650 Ti can drive up to 3 displays via these connectors, and if a partner equips a card with a DisplayPort connector instead it should be possible to drive the full 4 displays off of a single GTX 650 Ti.